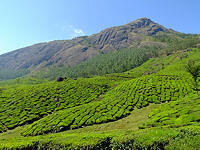 Next morning we left Kochin with a long drive ahead of us to the hill station and tea country of Munnar. Our very good driver, Shivan, pointed out all the interesting sights on the way, such as waterfalls, exotic birds etc. We arrived at the Windermere Estate. for our stay of two nights in time for afternoon tea at their garden hut tea room. The Windermere is a comfortable boutique country retreat situated in a beautiful environment of gardens, tea, coffee and cardamom plantations and a fabulous vista of hills beyond. Our room balcony looked out to the tea plantation. I also saw some exotic local birds such as Red Whskered Bul-Bul among the beautiful flowers in front of our balcony. Other rooms such as a villa room will have a spectacular view of the surrounding hills and the green valleys. We joined a late afternoon walk through the estate's cardamon plantation. We saw the black Malabar squirrel in the tree as big as a cat and of course many cardamom and coffee plants. The dinner that night was good with all local dishes such as Tandoori chicken, beef curry etc. and the best paratha I have ever eaten. The next morning breakfast was also good with the best exotic fruits such as tree tomatoes and passion fruit, with fresh natural unsweetend pineapple juice. Today we visited Munnar town. We started at the famous Tea museum, which is a demonstraion tea factory with tea processing shown step by step, and showing some old tools and machinery dating from the colonial era. We also visited a couple of interesting churches in town before lunch at the Ambady Estate. 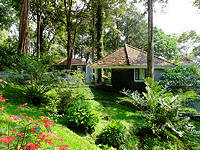 This is another plantation estate in Munnar that we will be using in our Superior hotels category. 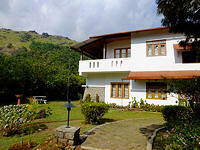 This estate is a bit out of the centre of Munnar hidden in a hilly forestry setting. The reception room is filled with antiques and bric-a-brac from a bygone era. It has a charming and homely feel to it. The garden is beautifully kept, over many acres of green lawn, exotic flowers and trees, in which the eight cottages are well-spaced out. All the cottages are the same, semi-detached, and having a large room with a high ceiling laid out over two levels. Entering the into the upper level, there is a sitting room area with sofa, chairs and coffee table. A few steps down to the lower level is the bedroom consisting of bed, wardrobe cabinet, TV and two cane armchairs facing the french doors opening to the gardens outside. A small garden table and chairs are placed on the lawn for enjoyment of the view of the gardens and surrounding hills and forests. The only slight disappointment at the estate is the restaurant. It is built like a garden hut to fit into the rural environment. It is quite dark even in daytime. The manager has agreed with me to re-build the restaurant into a dining room with open air and sunlight. They are already putting out garden tables and chairs on their front lawn by the old house for afternoon tea. The lunch with fish curry and chicken in banana leaves we had on that day was very good with lovely paratha on the side. In the afternoon we visited another hotel that we also use for clients, the Tall Trees Resort. This is a larger hotel with acres of well laid out landscaped hillside gardens and trees, rather like a well kept forest with rooms and villa accommodation spread around. We also tried their restaurant for our dinner that night with lovely dishes. 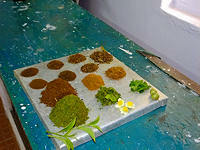 Next day we left the tea country of Munnar and drove to Periyar. This is spice country. 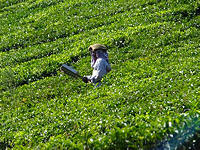 On route Shivan stopped at many places to offer us a last view of the beautiful green tapestry which is tea country. Our driver knows every good photo spot. 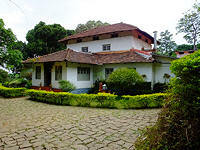 Before we arrived at Periyar we visited a lovely resort called Shalimar Spice Garden. This beautiful hotel is just outside the centre and hidden in the jungle. Arriving at the open wooden gate surrounded by colourful flowers and trees with no sight of the hotel, a step closer to the gate reveals a picture of palm trees and gardens, with a long wooden bridge over a stream below, geese and ducks enjoying the water. This is a striking and unique entrance to a hotel, one that we have not seen before. It certainly adds to the natural and peaceful atmosphere of the resort. The reception room is beautifully decorated with dark wooden furniture with colourful cushions like a boutique shop. 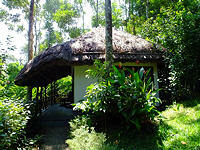 The beautiful garden villas with thatched roofs are set among the beautiful and natural gardens. The rooms are large with simple, bright and elegant design. There are also garden rooms with small patios for sitting looking into the exotic garden with many beautiful and colourful plants. There are many trees all round providing a haven for birds to sing the whole day long. This resort is like a treasure hunt in the jungle. The deeper you get in the more you discover. Beyond all the rooms and villas hid a lovely swimming pool and the best room in the resort, a suite. This is no ordinarily suite but a room built using doors, wall panels and shutters from old Kerala houses. The heavy wooden door opens to a dark wood-panelled cosy hall. Stepping beyond is a brighter bedroom. This suite is highly recommended for honeymoon couples who can enjoy privacy and is also near to the swimming pool. The lunch here was also excellent with fish curry and paratha. We are using this hotel in Superior hotels category.